My fiancée and I have been enjoying the art of perfecting the Hosted Weekend Brunch. Going out to brunch is a timeless pastime, but hosting an upscale meal at home feels luxurious and weirdly adult. Plus, “We’d love if you came for brunch—please, we insist” has an indulgent ring to it, like you have nothing better to do but plan menus and give parties. 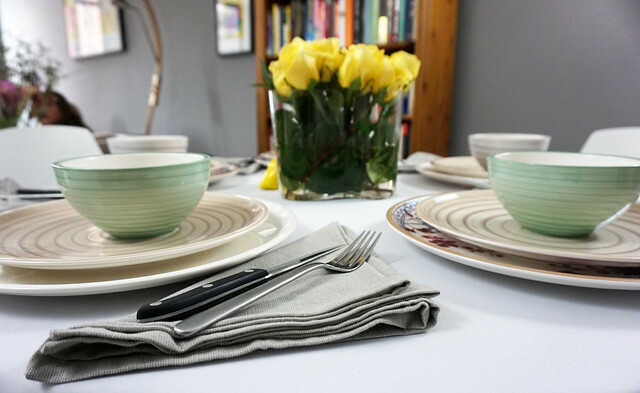 On a recent weekend, we invited three girlfriends over to share in our new pastime, and were lucky enough to show off some of Villeroy & Boch’s latest lines. They lent us their Artesano line, featuring a range of subtle colors and patterns that make for a great summer or fall table. The Artesano Nature bowls are perfect for small appetizers, especially those with any kind of sauce. 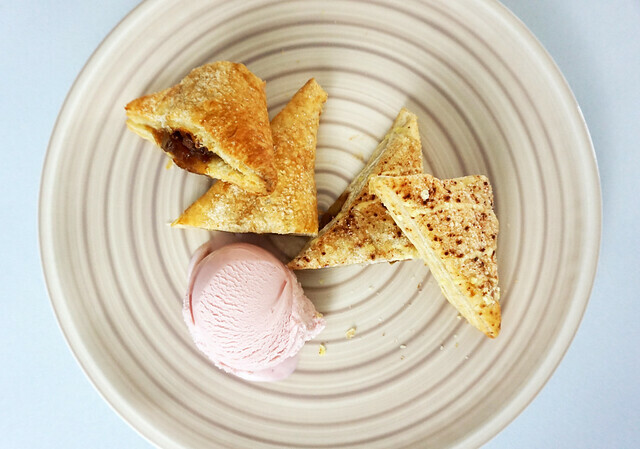 They are versatile enough to hold salad, fruit, ice cream and other appetizers or dessert. And their sister flat plates have soft spirals that make every dish look beautiful. 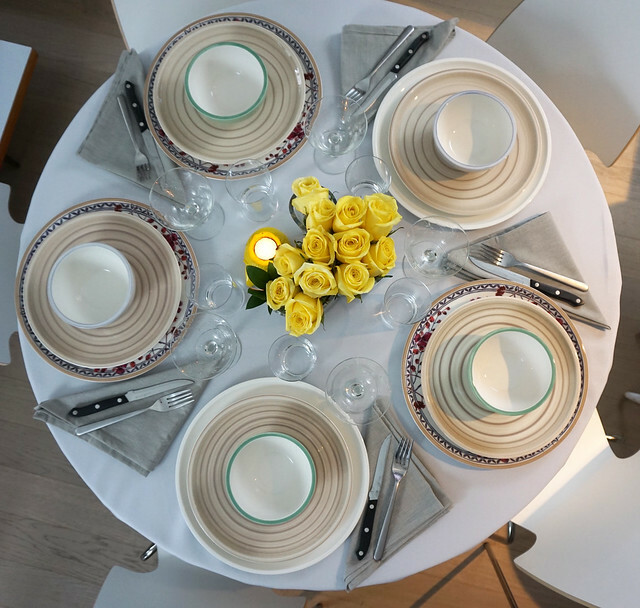 The Artesano Provençal Lavender plate made a perfect charger, and we mixed it in with the Artesano Original chargers, so the bright floral pattern was subtly incorporated into the table. 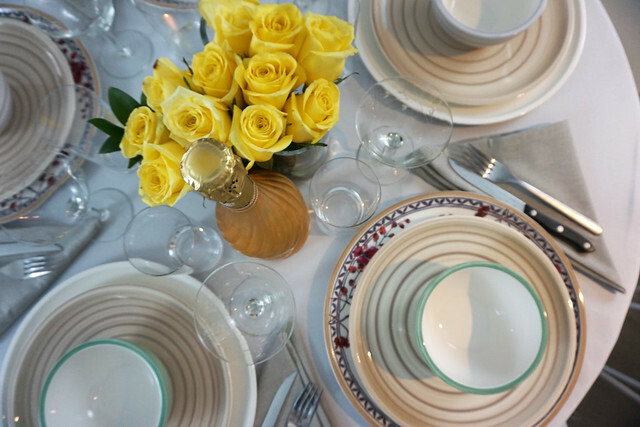 To round it out, we added soft gray linens and bright yellow roses. The Villeroy & Boch plateware made for a perfect brunch table. The plates present food beautifully, elevating anything you put on it and making the meal infinitely more artful—even simple fare. We opted for a fairly straightforward menu, and everything we plated looked instantly more elegant. The recipes below served five of us, and are portioned for a lighter lunch (with room for dessert, if you please). But they’re all flexible, and can easily be scaled up or down. There is hardly an appetizer that looks restaurant quality but is easier to make than this one. The egg make it a perfect brunch starter, and the parmesan perfects it. Sautée the asparagus on medium heat in olive oil and garlic until bright green and crisp, about 5 minutes. Fry the eggs, over easy (30-40 seconds per side, on medium high). 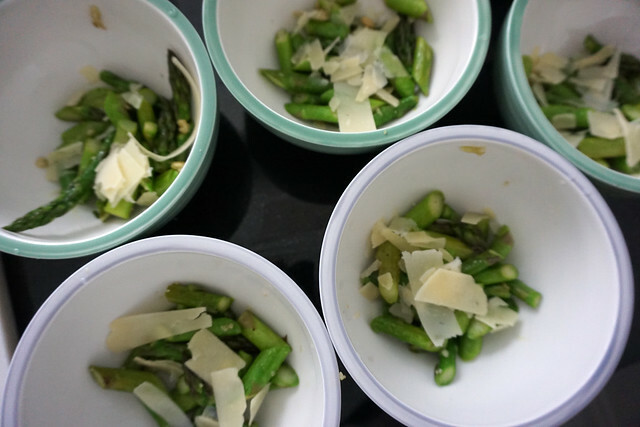 Layer the bottom of each dish with asparagus. Then add a layer of parmesan shavings, and top with an egg. Add salt and pepper to your liking. If you have the time and effort, poaching the eggs make this dish even more elegant. 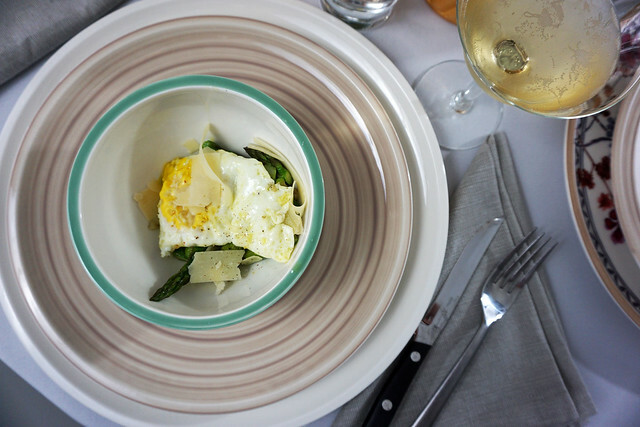 And we recommend being generous with the pepper; it helps balance the richness of the egg yolk and parmesan. Who doesn’t love a good wedge? This version has some fun with this steakhouse classic, and though it requires a bit more prep, the presentation pays off. Cook the bacon until crispy, about 5 minutes per side on medium heat. Let dry. Chop into 1” pieces. Chop the lettuce into equal squares, about 1” high. (They don’t need to be perfect). Peel the avocado and remove the pit. Slice horizontally, creating ovals, around .5” thick. Layer the salad ingredients into each of the glasses, in reverse: bacon, avocado, tomato, lettuce. Place glasses in the refrigerator for at least 15 minutes (longer is better), letting the salad form together. Meanwhile, make the dressing. Combine the heavy cream, olive oil, garlic, tarragon, black pepper, salt and lemon juice in a bowl and whisk until blended. (Feel free to adjust the volume of any ingredient for taste and consistency. Plate the salads: hold the plate over the glass and turn both over. Remove glass slowly, shaking carefully to release the salad. Ideally the cylinder of salad will stand on the plate and look really cool. Top with 1-2 tbsp dressing per serving. The denser the stack inside of the cup, the more likely the salad will stack and stay upright on the plate. (But they still look elegant if they fall apart). You can also modify the salad or dressing however you like. 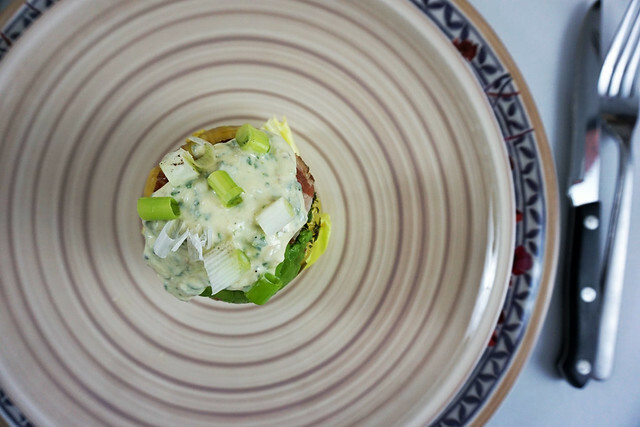 And if you are a wedge purist, and need your iceberg lettuce and bleu cheese dressing or crumbles … go for it. Make the glaze for the carrots and potatoes: mix the honey, olive oil, balsalmic vinegar, pepper and salt together in a bowl. Dredge the carrots and potatoes in the glaze, and arrange on a baking sheet covered in parchment paper. Bake for 25 minutes or until crispy. Meanwhile, cook the short ribs in a cast iron skillet or non-stick pan on medium high, 2-3 minutes per side, to your preferred doneness. Finally, cook the scallops on medium high, around 90 seconds per side. 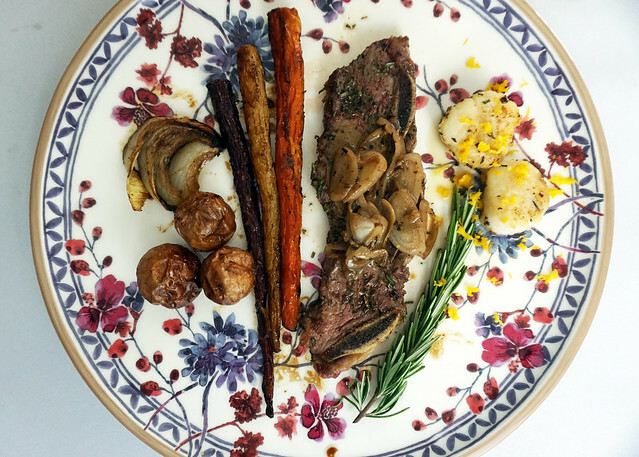 Serve the short rib strips, scallops, carrots and potatoes together. Sprinkle orange zest over scallops. The key to good short ribs (like most red meat) is buying good short ribs; they are worth spending a few extra dollars on. The cooking is the easy part. 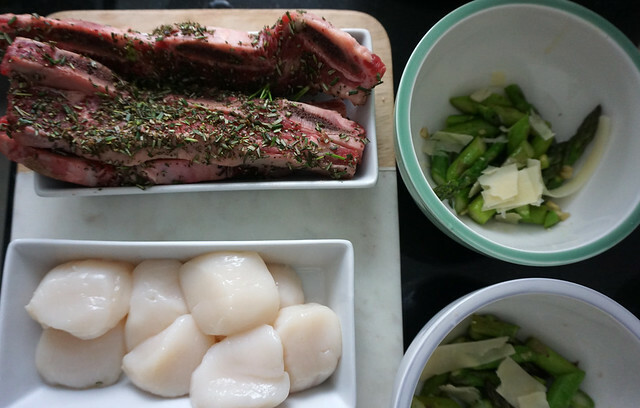 Also, scallops are easy to overcook, resulting in white chewy discs. You want a high sear, leaving the scallop cooked but soft and smooth. 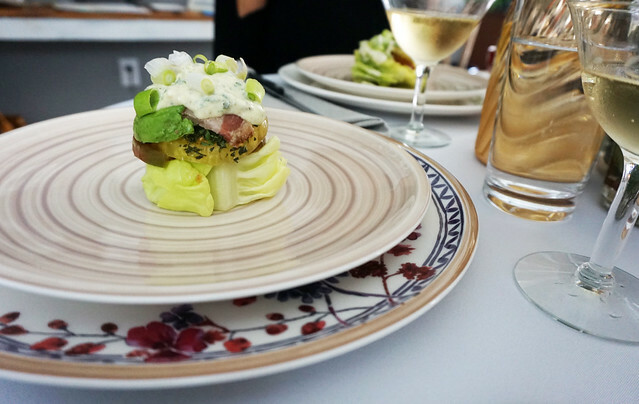 BitchBiz: While this post—and its recipes—were created independently, Villeroy & Boch did compensate us for this promotion and provide the plateware.